How do I create a new SkyDrive album? You can create a new album on your Windows Live SkyDrive a couple of ways. You can do it in your SkyDrive when you are logged in to your Windows Live account, or you can do it from Windows Live Photo Gallery. 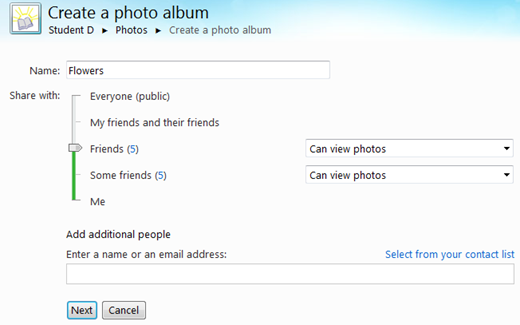 Actually there are some other ways, here I will discuss just how to create a new album on SkyDrive. Log in to your Windows Live account: Start your browser and go to live.com. Your browser might have remembered your credentials and logs you in, otherwise you will see the log in page. Click Photos on the link bar at the top. Type the name that you wish to assign to the album. Note that “New album” is the default name, it is already selected (highlighted) so you can type right over it. Pick who you want to share the album with. The default is Friends, but you can change that by clicking Change. Set the slider to the appropriate position for sharing. You can also share this album with people you specify in the area below the slider. Sharing of albums and folders is described in more detail another post. Click Next. The album will be created. On the next page you have the opportunity to add photos to the album by dragging them from Windows Explorer or from Live Photo Gallery. That process is described in another post. This entry was posted in SkyDrive and tagged albums, create album, digital pictures, Photo Gallery, photos, sharing photos, SkyDrive, Windows Live by Ludwig. Bookmark the permalink.